Circle of Excellence - Cynthia Timmerman, P.A. The Naples Area Board of REALTORS is proud to honor those members who strive for excellence. 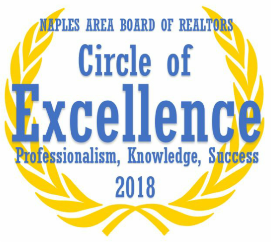 Please attend the NABOR Member Business Meeting on November, 8 at 9:00 am to be recognized for qualifying for the “Circle of Excellence”. Joining the prestigious “Circle of Excellence” demonstrates your commitment to reaching the highest level of professionalism as a REALTOR®. I commend you on your accomplishment and hope you enjoy its rewards.